The body might be considered the hardware of the complex technical device that is human thought. 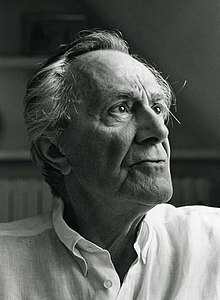 Jean-François Lyotard (10 August 1924 – 21 April 1998) was a French philosopher and literary theorist. Science has always been in conflict with narratives. Judged by the yeardstick of science, the majority of them prove to be fables. But to the extend that science does not restrict itself to starting useful regularities and seeks truth, it is obliged to legitimate the rules of its own game. I define postmodern as incredulity towards metanarratives. The logic of maximum performance is no doubt inconsistent in many ways, particularly with respect to contradiction in the socio-economic field: it demands both less work (to lower production costs) and more (to lessen the social burden of the idle population). But our incredulity is now such that we no longer expect salvation to rise from these inconsistencies, as did Marx. Here is the question: is a legitimization of the social bond, a just society, feasible in terms of a paradox analogous to that of scientific activity? What would such a paradox be? …Scientific knowledge does not represent the totality of knowledge; it has always existed in addition to, and in competition and conflict with, another kind of knowledge, which I will call narratives in the interest of simplicity. Knowledge is and will be produced in order to be sold, it is and will be consumed in order to be valorized in a new product. The moment knowledge ceases to be an end in itself—its realization of The Idea or the emancipation of men—it’s transmission is no longer the exclusive responsibility of scholars and students. It is generally accepted that nature is an indifferent, not deceptive opponent, and it is upon this basis that the distinction is made between the natural and the human sciences. True knowledge, in this perspective, is always indirect knowledge; it is composed of reported statements, that are incorporated into metanarratives of a subject that source their legitimacy. Let us wage war on totality; let us be witnesses to the unpresentable, let us activate the different and save the honor of the name. Our working hypothesis is that the status of knowledge is altered as societies enter what is known as the postindustrial age and cultures enter the postmodern age. The relationship of the suppliers and users of knowledge to the knowledge they supply and use is now tending, and will be increasingly tend to, to assume the form already taken by the relationship of commodity producers and consumers to the commodities they produce and consume--that is, the form of knowledge. Knowledge in the form of an informational commodity indispensable to productive power is already, and will continue to be, a major-perhaps the major- stake in the world wide. It is conceivable the nation state will one day fight for control of information, just as they battled over territory, and afterwards for control of access to and exploitation of raw materials and cheap labor. A new field opened for industrial and commercial strategies on the one hand, and political and military strategies. For the mercantilization of knowledge is bound to affect the privilege the nation-states have enjoyed, and still enjoy, with respect to the production and distribution of learning. The notion that learning falls within the purview of the State, as the brain or mind of society, will become more and more outdated with increasing strength of the opposing principle. Already in the last few decades, economic powers have reached the point of imperiling the stability of the state through new forms of the circulation of capital that go by the generic name of multinational corporations. Legitimation is the process by which a legislator is authorized to promulgate such a law as a norm. What is new in all this is that the old polies of attraction represented by nation-states, parties, professions, institutions, and historical traditions are losing their attraction. And it does not look as though they will be replaced, at least not on their former scale. The grand narrative has lost its credibility, regardless of what mode of unification is uses, regardless of whether it is a speculative narrative or a narrative of emancipation. The decline of narrative can be seen as an effect of the blossoming of techniques and technologies since the Second World War, Which has shifted emphasis from the ends of action to this means; it can also be seen as an effect of the redeployment of advanced liberal capitalism after its retreat under the protection of Keynesianism during the period of 1930-1960, a renewal that has eliminated the communist alternative and valorized the individual enjoyment of goods and services. While we talk, the sun is getting older. It will explode in 4.5 billion years. … In comparison everything else seems insignificant. Wars, conflicts, political tension, shifts in opinion, philosophical debates, even passions—everything’s dead already if this infinite reserve from which you now draw energy to defer answers, if in short thought as a quest, dies out with the sun. … The inevitable explosion to come, the one that’s always forgotten in your intellectual ploys, can be seen in a certain way as coming before the fact to render these ploys … futile. … In 4.5 billions years there will arrive the demise of your phenomenology and your utopian politics, and there’ll be no one there to toll the death knell or hear it. It will be too late to understand that your passionate, endless questioning always depended on a “life of the mind.” … Thought borrows a horizon and orientation, the limitless limit and the end without end it assumes, from the corporeal, sensory, emotional and cognitive experience of a quite sophisticated but definitely earthly existence. With the disappearance of the earth, thought will have stopped—leaving that disappearance absolutely unthought of. … The death of the sun is a death of mind. … There’s no sublation or deferral if nothing survives. … The sun, our earth, and your thought will have been no more than a spasmodic state of energy, an instant of established order, a smile on the surface of matter in a remote corner of the cosmos. … Human death is included in the life of the mind. Solar death implies an irreparably exclusive disjunction between death and thought: if there’s death, then there’s no thought. Matter asks no questions, expects no answers of us. It ignores us. It made us the way it makes all bodies—by chance and according to its laws. Philosophy is possible only because the material ensemble called “man” is endowed with very sophisticated software. But also, this software, human language, is dependent on the condition of the hardware. Now: the hardware will be consumed in the solar explosion, taking philosophical thought with it (along with all other thought) as it goes up in flames. So the problem of the technological sciences can be stated as follows: how can we provide this software with a hardware that is independent of the conditions of life on earth? That is: how can we make thought without a body possible? In the discussion we had last year at Siegen, in this regard, emphasis was put on the sort of emptiness that has to be obtained from mind and body by a Japanese warrior-artist when doing calligraphy, by an actor when acting: the kind of suspension of ordinary intentions of mind associated with habitus, or arrangements of the body. It’s at this cost, said Glenn and Andreas, … that a brush encounters the “right” shapes, that a voice and a theatrical gesture are endowed with the “right” tone and look. The soliciting of emptiness, this evacuation—very much the opposite of overweening, selective identificatory activity—doesn’t take place without some suffering. … The body and mind have to be free of burdens for grace to touch us. There’s a necessity for physical experience and a recourse to exemplary cases of bodily ascesis to understand and make understood a type of emptying of the mind, an emptying that is required if the mind is to think. This obviously has nothing to do with tabula rasa, with what Descartes (vainly) wanted to be a starting from scratch on the part of knowing thought. This page was last edited on 27 February 2019, at 22:22.